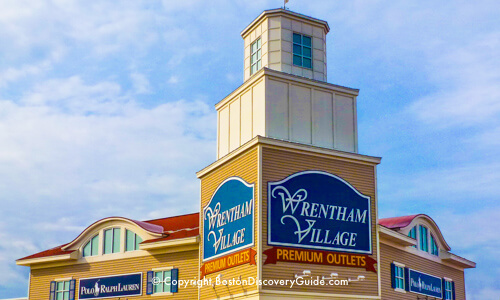 Want to see where the Sons of Liberty plotted the American Revolution? Or raise your glass at the oldest bar in Boston? Visit these historic Boston bars and taverns where Bostonians still gather today. Boston's oldest bars, pubs, and taverns may be exactly the historic part of the city you'll enjoy the most if you long to follow in the footsteps of the Founding Fathers - and enjoy some refreshment at the same time. You'll even find one that morphs into a popular Boston dance club at night. Yes, Boston's early Patriots loved their brew and hatched some of their best plots against the Redcoats while quenching their thirst in their favorite local watering holes. The taverns like to claim that they fueled the fervor behind the revolt against British rule . . . and there does appear to be some truth to that. 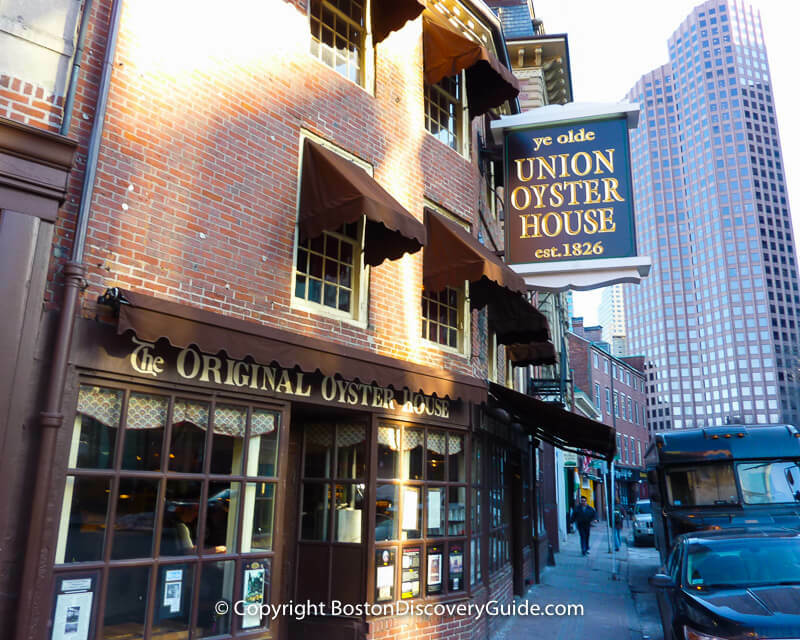 So if you're visiting Boston and want to tell your friends back home that you toured historic sites and saw with your own eyes where the Sons of Liberty planned the American Revolution, put these historic bars and taverns on your "must visit" list. Who knows, you might even sit in the very same spot where Paul Revere or George Washington raised a glass. The original building no longer exists - it was apparently razed in the 1850s - although you can see a small sketch of it on the wall. But no matter. Paul Revere writes in his memoirs about clandestine meetings that he and the other Sons of Liberty - Samuel Adams, John Adams, Dr. Joseph Warren, and others - held in the Green Tavern. When they began to worry that the Redcoats were going to march to Concord to look for munitions, the tavern is where they organized an eavesdropping operation to overhear British troops discuss plans. Did the Sons of Liberty really meet here so often that the Green Dragon, as the current establishment claims, come to be called the "Headquarters of the American Revolution?" It's possible. Later, in 1788, the Patriots met in the pub to draw up a resolution to support the Federal Constitution. 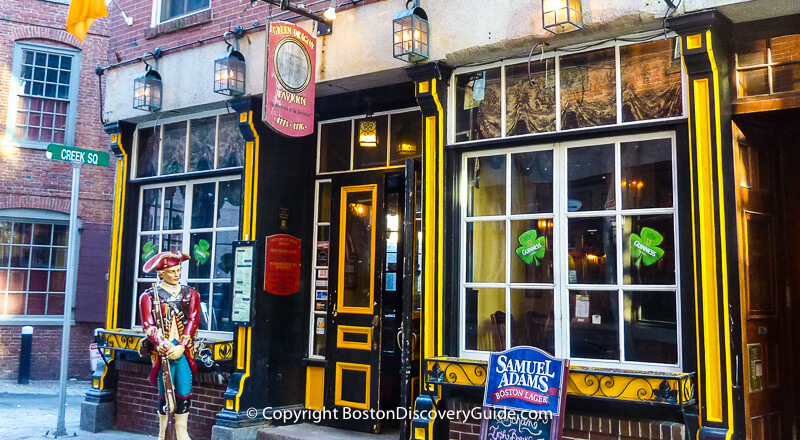 So when you stop by this historic Boston bar for a brew, you truly are following the footsteps of American history, even if the location of those footsteps has shifted a bit. Today's Green Dragon opened in 1993, located on a small lane in the oldest part of the city, close to the original's site at the corner of Union and Hanover Streets, and around the corner from Faneuil Marketplace. Late at night, the Green Dragon and other bars, restaurants, clubs, nightlife in this area attract large crowds, especially on the weekends. For a quieter experience, go earlier in the day when sunshine pours in through the large windows. Order a burger and a beer, and you'll understand why the Patriots also enjoyed hanging out here as they drank and plotted. 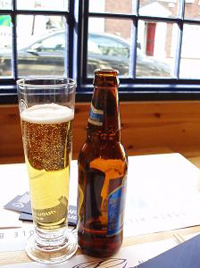 Located in nearby Charlestown, Warren Tavern claims to be the oldest tavern in Massachusetts as well as the most famous watering hole in the United States. 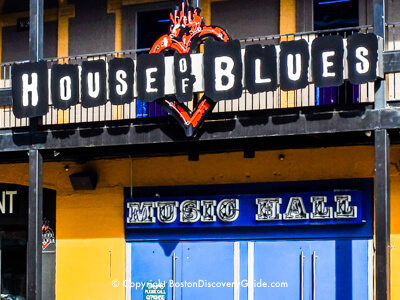 Among Boston's historic bars and taverns, it is the oldest still in its original building and location. 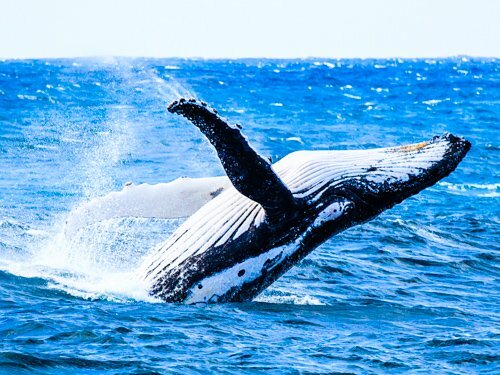 Aside from brief closures between owners, it has operated continuously since its opening. The Tavern was built in 1780 by Captain Eliphelet Newell, who fought at Bunker Hill and had been a close friend of Sons of Liberty leader and fervent Patriot, Dr. Joseph Warren, who was killed by the British at Bunker Hill. Captain Newell named his tavern after his friend. Warren Tavern is one of the most historic Boston bars, even down to the beams in the ceilings, which the builders salvaged in 1780 from old boats at nearby Charlestown Navy Yard - making the beams even older than the rest of the tavern. 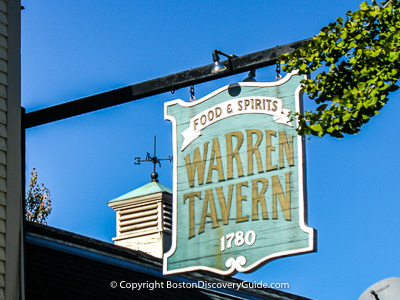 Even though Warren Tavern is close to the Charlestown part of the Freedom Trail and not far from Bunker Hill, you'll usually see mostly locals and professionals who work nearby, with perhaps just a table or two of Boston visitors soaking up the historic ambiance. This is a place where you literally might be sitting in the same spot where Paul Revere and George Washington sat 200+ years ago. Of course, unlike current patrons, they didn't get to enjoy sports on the flat-screens at the bar. Jimmy Wilson, Boston's last Town Crier, built Bell in Hand after he retired from shouting out the town's news - and of course, "Bell in Hand" refers to the bell that he used to carry around while on the job. He reported on all the big events of his time: the Boston Tea Party, the Declaration of Independence, the Battle of Bunker Hill, the Defeat of the British. 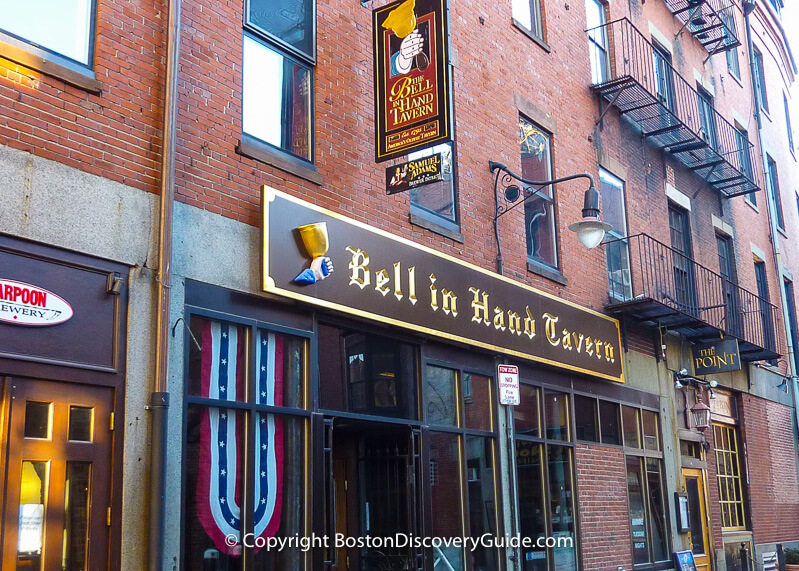 Bell in Hand has occupied its current very attractive building since 1844, but the bar is the original from its 1795 site, near today's Government Center T station. You can see one of the original signs with a hand holding a bell in Boston's Old City Hall, near the Benjamin Franklin Statue on the Freedom Trail. Early Bell in Hand patrons included Daniel Webster and Paul Revere (Revere seems to have frequented every Boston bar for miles around during his long lifetime). Jimmy Wilson didn't believe in "hard stuff" (no doubt he'd seen more than his share of alcohol-fueled street brawls such as the one that led to the Boston Massacre during his Town Crier stint), so the Bell in Hand served nothing stronger than Smith's Philadelphia Cream Ale until 1919. With 2 floors, 5 bars, and large screens, Bell in Hand is one of the liveliest nightspots in the Faneuil Hall area. Expect to pay a cover charge on after a certain point on most nights, when this historic bar morphs into a popular Boston dance club that attracts lots of college students and a mostly 21-to-30-something crowd. 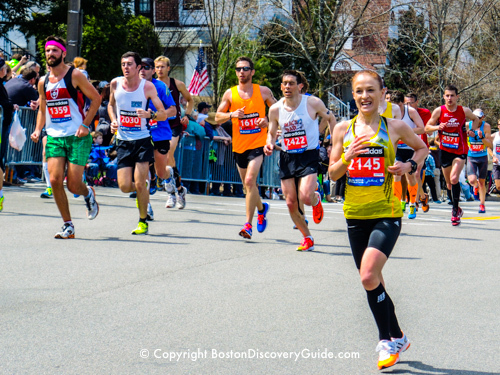 Want to Know More about Boston Taverns? Check out Historic Taverns of Boston by Gavin R. Nathan, who crams almost 400 years of history about Boston taverns into this fascinating guide on our favorite books about Boston list.